garth & me, ruining greg & jamie’s picture. i mean, ENHANCING it…. saturday morning came a little earlier than i would have liked, but there’s no time to lose when you’re on vacation in dc, so i rallied (can you rally at ten a.m.?) and we set out to take on the day. we stopped at panera bread for some quick sustenance and then hopped on the blue line in chinatown to head to arlington. we plan our annual trip around the wreaths across america ceremony, and with this year being the 150th anniversary, i wasn’t going to miss it for anything. upon our ascension on the escalator, we saw swarms of people all around us. i knew it would be packed, so we made a beeline for the nearest truck to see if there were any wreaths left. to no surprise, they were all already dolled out, but that didn’t keep us from sticking around to see the sites. since we were close by, we first moseyed over to the marine corps war memorial. even though it’s a bit out of the way from central dc, it’s certainly still worth a visit if you’ve got the time and the means of transportation. it’s amazing how large and well-done it is. another one of my favorites behind lincoln and jefferson. we continued our walk back through the cemetery, taking in the solemn beauty of the scene. it seemed wreaths were everywhere this year. i point out that fact because they usually only do some sections with wreaths. i like that they made an exception for this special year. quite elegant, don’t you think? lenora and i were the caboose of the bunch, so i didn’t mind having a strolling buddy for the rest of the morning. we quickly toured robert e. lee’s home, watched a handbell performance, and took in the breathtaking view from our elevated position. such a perfect day! we climbed up and then down several staircases to trek to the tomb of the unknown soldier. it was the top of the hour, so folks were packed deep to see the changing of the guard. lenora and i were not able to see much, even on the toppest of our tiptoes, but with greg’s tree-like stature, a few pictures were snapped. it’s a very moving performance as the commander and sentinels exchange places to guard this sacred place. we eventually met up with everyone at the eternal flame, which marks the grave sites of some of the kennedys. president kennedy is only one of two presidents buried in arlington, the other being president taft, who died in 1930. his children patrick bouvier and an unnamed stillborn daughter were reburied there later in 1963. president kennedy’s brother robert f. kennedy is also buried in arlington, his grave marked by a simple white cross. our legs had grown tired on our morning journey, so you can imagine we were all eager to pop a squat, and what better way to do it than eating lunch and enjoying drinks! that’s right, that way is a great way. back to the metro we went, and a short walk later, we popped into shaw’s tavern for a tourist takeover. check out these sick photography skillz. our cheery waiter was excited to have our amusing group at his tables, so we made sure to be entertaining patrons. i nearly chugged my water, for the previous night’s festivities had left me parched. it was then, all of a sudden, when someone mentioned bottomless mimosas that i readied my game face. count me in! with only two hours for this happy hour deal, we were sure to empty our glasses quickly so that the waiters could fill them right back up. in a brief lull here, i’ll say just how much i love this trip. each year the trip is a little bit different, but it always exceeds whatever expectations i may have had. with different folks and different activities, you never know what kind of memories you will make. i am quite thankful that this group of friends seems to just go along with my plans, so easily also. this is the part where i tap my fingertips together in mischievous amusement. hehe. as our eyes perused the menu, nearly everything looked like a good choice. our group was ravenous and ready to order, so we were quick when the waiter returned to take down our selections. i was torn between the chicken and waffles and shrimp ‘n grits, so i asked the waiter for his recommendation. with much conviction he answered that i should get the chicken and waffles. “really?” i asked, for i was still unsure. “well, you asked for my opinion, and i think you should have the chicken and waffles.” ooh, he’s got a little attitude, i like it! 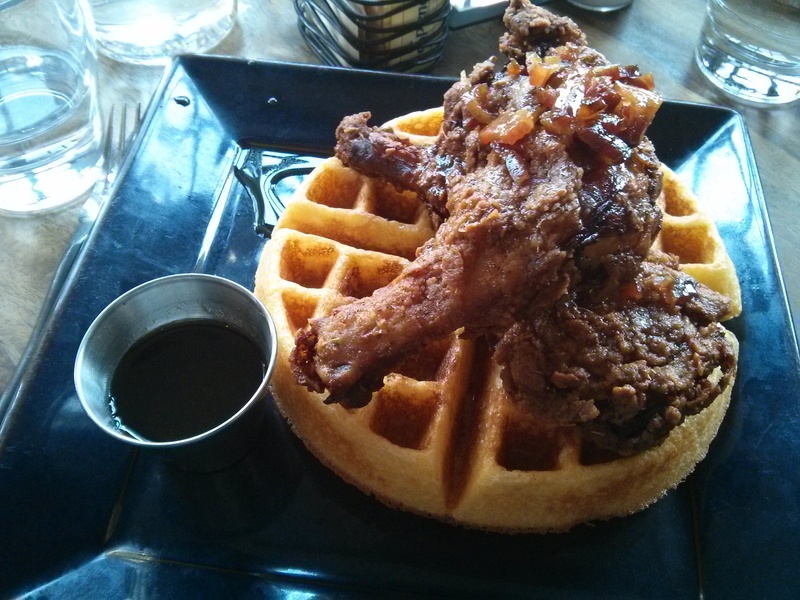 so, chicken and waffles it was! when the plate was brought to me, i was ready to dig in and fill my belly. 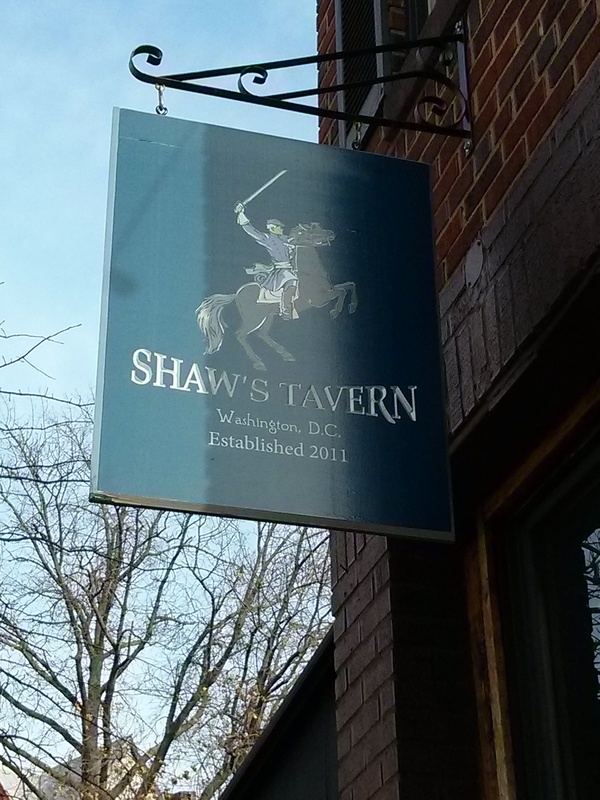 i’ve had my fair share of chicken and waffles lately, so i was interested to see how shaw’s tavern’s take on it would be. first, i acutally liked that the chicken was still on the bone, that they weren’t simply deep fried chicken fingers. although it extended the eating process, i really didn’t care at all, for i am a slow eater anyway. the chicken’s skin was crispy and melty, all at the same time. i “accidentally” ripped off a huge chunk of the coating and promptly ate it in a single bite. i promise, i don’t know how it happened! the waffle was actually a cornbread waffle, something i had never seen but loved plenty. its mealy texture paired well with the crunchy and juicy chicken. i didn’t need the syrup at all, something i have found to be the norm when i’m eating this dish. and you know, if i recall correctly, i think i ate up the whole plate! go, kels! to my right, jamie had a burger. all that shaw’s sauce on the other side of the bun looked decadent along with the over-easy egg. anything with a egg on top if almost always a good choice, especially when the yolk gets all runny and all over the plate and your hands. yissss. greg, nathan, and garth all ordered some cast-iron dish that had mac’n’cheese and sausage tucked underneath two eggs. i had also considered ordering it, but a bite of garth’s was all i needed. it was very rich, and even the biscuits on the side were delicious. this meal is one of those that is either going to put you to sleep immediately or, with the right kind of drink accompaniment, will get you ready for a fun day. we rounded out the three o’clock hour with the final glassfuls of mimosas and threw ourselves back out into the afternoon. it wasn’t too long of a walk back home, so we meandered along the sidewalks to chinatown. we still had plenty of the sailor jerry handle left, so we kicked off our shoes, put up our feet, and played cards as the sun sank behind the dc skyline. it wasn’t too long before we were hungry again, and even though we had a huge sheetcake still in the refrigerator, i knew desserts wouldn’t hold us over very well. we actually ventured back to the shaw neighborhood for dinner at right proper brewing company. it was going to be a bit of a wait for our larger party, so we shed our layers and gathered out of the way. i was ready to keep the party rolling, so i bellied up to the bar and ordered a beer. i made the loveliest small talk with a handsome couple next to me, hearing the sweet story of how they met. it was a charming “and the rest was history” kind of tale, and they were genial in letting me bother them. nathan came to save them from me, as our table was ready for us. “take care, and merry christmas!” i hollered before i got too far away. you just never know when and where you’ll meet the nicest people. i’m going to have to be honest here with you all, for as i was scrolling through the photos in my phone of the weekend’s trips, i came up on the picture of my dinner at right proper and, as i so embarrassingly realized, i have nearly no recollection of actually eating this meal. 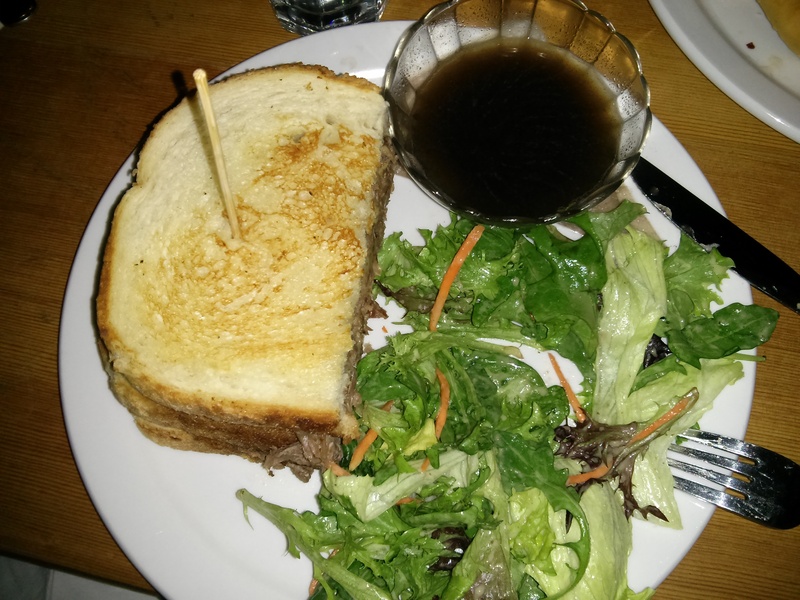 i vaguely remember drenching the lamb french dip in the red wine dipping sauce and, subsequently, sloshing it over the sides of the bowl and onto the plate and table. i am hoping the sandwich was everything i needed it to be in that moment, and i’m going to safely assume that the salad was quite pointless at this time of the night. so! we’ll guess that i liked the sandwich, i ate almost all of it, and that the last few bites were probably cold because i was busy running my mouth. 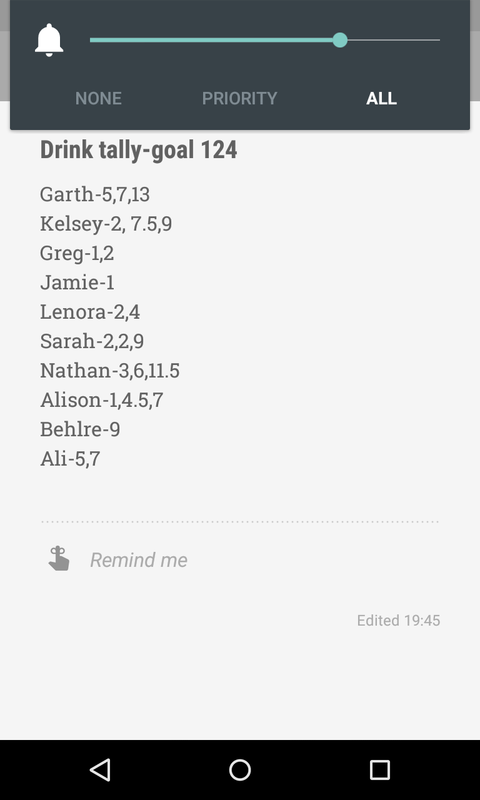 the reason i don’t quite remember everything about that saturday night is probably due to the generous amount of drinking we had done and were doing. we had a goal to meet, and i needed to do my part! i suspect we continued the festivities after dinner when we returned home. i roughly remember playing more cards, and i distinctly remember almost falling off the stool at the table because i was so tired. well, it was at about that point i thought it better to go ahead and call it a day so that i could rest up. good job, saturday!